A – Z of Startup funding at e-Hotel, Chennai on 10th jan 2019. This was to facilitate business owners to become part of startup ecosystem – in building startups and also to invest in the startup community. It started with an Expert Talk by Shyam Sekar S, Founder and Chief Mentor at Startup Xperts. Shyam unraveled the details as to how to build startup ecosystem and how investors can support the startups in taking things forward to the next level. It was very well appreciated by the business owners and aspiring entrepreneurs. 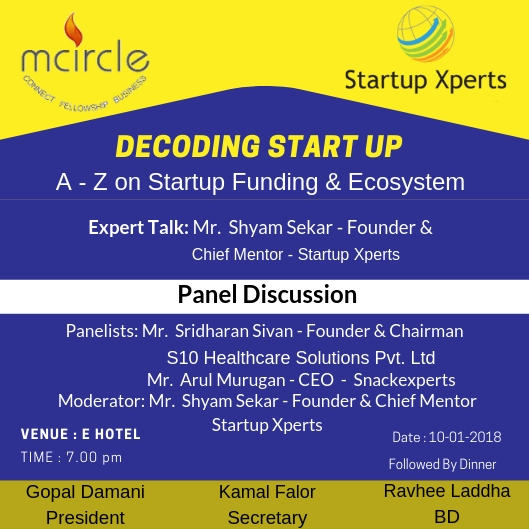 There was a Panel Discussion on Decoding Startup Funding, which had esteemed panelists, Mr Sridharan Sivan, Founder & Chairman at S10 Healthcare Solutions and Mr Arul Murugan, CEO of Snackexperts. This panel discussion was moderated by Mr Shyam Sekar S of Startup Xperts. This was enlightening the audience to understand these startup founders journey from different perspectives and encouraged the audience to explore options of investing in the startup ecosystem.